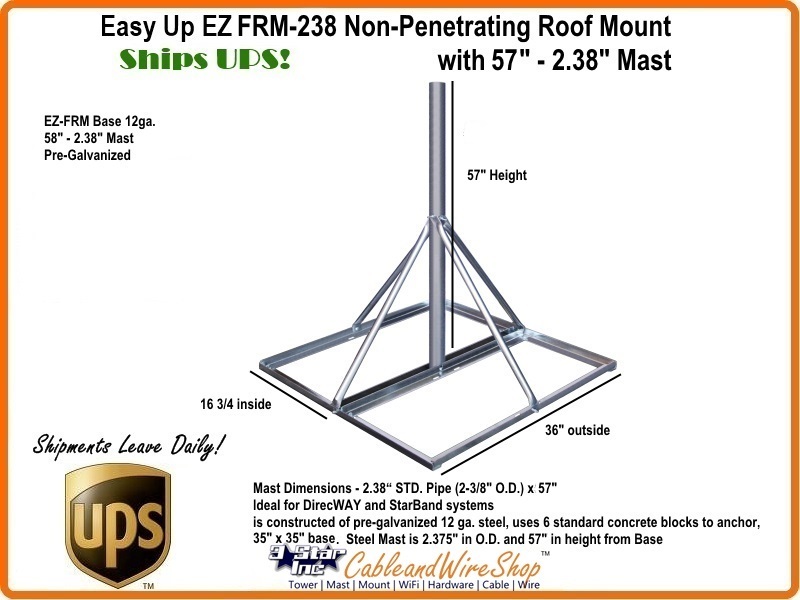 Ideal for Light Off-Air TV and Wireless Internet Antenna mounting, is constructed of pre-galvanized 12 ga. steel, uses 6 standard concrete blocks to anchor, 35" x 35" base. Mast pipe length will be 58" actual length for shipping purposes. Note: Height and Antenna Loading capability are dependant upon ballast weight. You need to Consult an Engineer to determine the Load Bearing Capability of the roof that you are entertaining such an Installation . It is Important to choose a Mount and Mounting Location with a Picture of the Finished Installation in Mind. Be Sure to First select a location that lends itself to applying a Load without Compromising the Integrity of the Material you affix to. Most Decorative Finishes most often do not have the Strength to Hold a Weight or Pressure without fail. Further, Think about what's underneath the exterior. Is it stronger, or will it yield to Pressure over time also? Weather Proof the Installation to Maintain the Integrity of your Home. Next consider the Location over a Lifetime of Adjustments, does it lend itself to modifications in Height or Direction? Larger Antennas increase the surface area presented to air movement, Hence, Wind-load does increase. As the length of the mast increases from Its last attached point on the structure, the torque applied in cantilever also increases with Weight and Wind-Load, requiring a more substantive attachment and Load-Bearing material. Keep the Distance Minimal from the Antenna to the TV's and Equipment you feed, as to minimize loss and the need for Amplification.